The town of Broome on the coast of Western Australia has put its sister city, Taiji, Wakayama Prefecture, on notice: Stop the yearly dolphin slaughter or the relationship is off. The local council in Broome voted unanimously Saturday to send a warning to Taiji to end its dolphin “harvesting,” council head Graeme Campbell said Monday. “The council respectfully advises . . . Taiji that it will be unable to fulfill its pledge as a sister town of Taiji while the practice of harvesting dolphins exists,” Campbell told The Japan Times. The town will advise Taiji through diplomatic channels, he added. Taiji has drawn heavy criticism, especially from antiwhaling groups overseas, for its dolphin slaughters since the practice came to light in 2005. Akio Usagawa, chairman of the Taiji International Friendship Association, said the town has not yet received the ultimatum from Broome, which has been Taiji’s sister city for 28 years. The two towns also have a longer historic relationship: People from Taiji migrated to Broome to train locals how to collect pearls about 100 years ago. The Broome council’s resolution says it has always recognized the relationship with Taiji and Taiji’s assistance in the development of the town’s pearl industry. Taiji will consider what action to take after receiving a formal notice from Broome, Usagawa said. “Taiji and Broome have had really good relations,” he added. Taiji has been pressured by various interest groups about dolphin catches, but not to the extent that the assembly felt compelled to take up the issue, Usagawa said. According to the Fisheries Research Agency, 12,813 dolphins were caught in Japan in 2007, of which 10,218 were in Iwate Prefecture and 1,623 in Wakayama Prefecture. 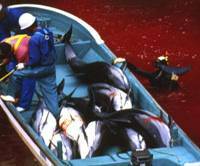 Usagawa said it is fair to say almost all dolphin catches in Wakayama are in Taiji. 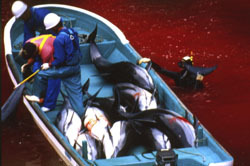 Dolphins are eaten or sold to aquariums in and outside Japan, he said.